Shardul Pandey: I welcome you Lorelei at SANGKRIT.net, please tell our netizens about yourself. Lorelei Lanford: My love for the cinema came at a very young age. I remember being 5 or 6 years old and watching the movie “Gentlemen Prefer Blondes” with Marilyn Monroe and thinking “I want to do what she is doing” I was lucky to be born In a very artistic family. At the age of 10, I moved from my homeland to the exotic island of Tahiti. I taught myself Tahitian dancing just by watching local dance groups perform then running home to practice in front of the mirror. I later won the title of “Best Dancer of the Year” A first for a European girl! I came back to my first love, thanks to my dad, Guy Bodart, who had started directing feature films. I learned everything from him. I was taking the sound, working the fog machine to editing the film. In 1991 I got the lead role in the film “The Antichrist” but I am much more at ease behind the camera than in front. I now produce, write scripts and am involved in the casting for all IFA Pictures productions. And I am the 1st assistant director on our next feature film “All Hallows Eve” which is something I am really excited about! Shardul Pandey: What do you personally think is one thing which is god gifted in you, one thing you thing in which you are best. Lorelei Lanford: I am my worst critic but definitely directing. I love reading the script and visualizing the film. In film directing, you have to be creative but also have great managerial skills. That is my forte. Shardul Pandey: Did you always have plans for production or it just happened? How exactly you got interested in production work? Lorelei Lanford: No! I thought I was going to be a movie star (Laughing). I never really liked watching myself on-screen and I became much more interested in the making of the film. Producing came naturally to me. Shardul Pandey: Is film-making an easy job or more strenuous than people realize? Lorelei Lanford: It is not a glamorous job at all.. People only see the Academy Awards and do not realize how tough of a business it is. And when you do get a job, you better be prepared to work extra long hours..
Shardul Pandey: Do you have any ultimate goal to fulfil as a film-maker? Shardul Pandey: So when you are planning to announce your next feature film “All Hallows Eve”? Lorelei Lanford: We are having our Premiere here in Las Vegas in April. I do not know of the exact date yet but it will be our website and we are going to the Cannes Film Festival in May. Shardul Pandey: Would you like to tell us something about your next film “All Hallows Eve”, may be a little about the theme, story and characters or what-so-ever you like, anything? Lorelei Lanford: I do not want to give too much away but it is based on why and how Halloween or All Hallows Eve as it was called, started. I have always been fascinated with history..
Shardul Pandey: What do you find to be the most gratifying aspect of film making? Lorelei Lanford: To see people enjoy what you created. Shardul Pandey: Would you like to tell us about other projects in which you are currently working on? Lorelei Lanford: I am currently working on 2 other projects. One is a vampire film entitled “Inmortuorum” which means “The Undead” in Latin and “Wings of Glory” which is very dear to me. It is based on my Great Uncle Stephane Stolz who at 16 escaped the Germans and enlisted with the RAF to become a fighter pilot during the 2nd war. He had an incredible life and I hope I will do him justice. Shardul Pandey: Is there any other creative mediums you like working in? Any hidden talents? Shardul Pandey: Explain the time commitment you put into your movies. What do you do for entertainment? Do you have any peculiar interests? Lorelei Lanford: Yes I can easily work 12-16 hrs/day during production. During my down time, I like to read, do photography and I am also an animal activist. My pets are all rescues. I am working to have my animal foundation. Shardul Pandey: So do you get to travel for your work? What’s your favorite city that you have visited? Lorelei Lanford: Yes, I do get to travel a lot. My favorite city is Paris…. But there are still many countries that I have not visited yet. Shardul Pandey: Tell me something about your city, your favourite hang out spots there ? Lorelei Lanford: Las Vegas is definitely a city that never sleeps. I am not into clubs but I do enjoy going to the shows. In the spring and summer, you will find me boating on Lake Mead. Shardul Pandey: And what’s your dream holiday destination? Shardul Pandey: Now a few question related only to you. What are you likes and dislikes? Lorelei Lanford: I really cannot be around people who lie. You lie to me once and you are in my little black book (laughing). What I admire? Generosity and kindness..
Shardul Pandey: Tell us about your favourites. Lorelei Lanford: My favourite colour is RED. Favourite film? So many films that I love! Sound of Music, Some like it Hot, The Godfather, White Christmas. Favourites in International music: I grew up admiring French singer Daniel Balavoine. He had such inspiring songs. Favourite holiday destination: I really would love to go back to Austria for Christma. Favourite festival: Cannes! Favourite hobby: I love gardening. I am still decorating my house and of course my first love which is dancing! Favourite food? I LOVE to eat. Italian, French, Indian and Chinese. Shardul Pandey: How would you like to be remembered? Shardul Pandey: How you communicate with other netizens? How often you reply to them? Lorelei Lanford: I do have Facebook and Twitter. I do try to answer each email but I get hundreds! I actually did meet some of my FB friends. My Facebook is facebook.com/lorelei.lanford.9 and my twitter is twitter.com/LoreleiLLanford. Follow me and email me! Shardul Pandey: What is your ultimate message to netiznes? Shardul Pandey Talks To Vivek Sharma, Founder Of Filmzone Creations Pvt Ltd.
Shardul Pandey: I welcome you Vivek at SANGKRIT.net. How are you? On what new projects you are currently working on ? Vivek Sharma: Hi Shardul. I am good. Hope you are good too. As you must have heard that I have opened my own production house, Filmzone Creations Pvt Ltd.
And now I am producing and directing many films. Making one film in 8 Indian languages, first of its kind and each language will have different actors, locations and music. Its like creating history. Its a commercial film, black humor on recession. Shardul Pandey: I am fine. Thanks. Yes, Priyanka told me about your new production house, Filmzone Creations Pvt Ltd. It seems to be very interesting. So did you always know you were going to be a movie producer ? Shardul Pandey: So how your journey has been, starting from your childhood when you made up your mind to become a director-producer-writer that has finally grown into this climax of yours ? Vivek Sharma: Well I can give a brief points as I am writing a book on my journey. Mahanagry 1094 up, details will be in that. But it started from Jabalpur, Madhya Pradesh from where I did my masters in physics. Trained in martial arts..a football player. And a dream of making difference in people’s life.. Came to Mumbai with Rs. 250 in pocket. Struggled..worked hard…learnt a lot from common people and survived on my own. Lived in pipe lines, spent nights in watchmen’s cabin…corridors..station platform..
Shardul Pandey: Likewise you are working on many big movie projects so when you are planning to announce your next film. I mean, would you like to give any rough idea of next big announcement from Filmzone Creations Pvt Ltd. ? Vivek Sharma: Filmzone creations will be announcing 3 big projects around December..but pre-productions have already been started. Shardul Pandey: I read somewhere (but I did not save the references) that Yash Johar And Karan Johar were not sure to use Rani Mukerjee’s original voice in Kuch Kuch Hota Hai. It was you who stood by her and forced makers to use her real voice. Is it true or a rumor? Vivek Sharma: Yes I convinced Karan and Yash uncle to retain Rani’s original voice and stood by her. Worked very hard on her dubbing. I was the post production designer for ‘Kuch Kuch Hota Hai’. I did as Yash ji and Shakhan(srk) wanted me to. Shardul Pandey: You started your career from ‘Kuch Kuch Hota hai’, worked in various capacities and then ‘Bhoothnath’ was your directorial debut. So what was it like to film your debut movie? Was it different from other experiences you’ve had? Vivek Sharma: I was blessed to have worked with great talents like Mahesh Bhatt, Shah Rukh Khan and many others. I learnt and learnt and learnt. When I was starting Bhoothnath I had no fear. It was clear what I wanted. Amit ji and shri Ravi Chopra supported me through out. I can not ignore contribution of Juhi ma in my life and in my career. She has been there for me as a guide as a sister. Yes making film on your own is different than designing filmz for others. Its an awesome feeling to witness to see your own creation. :) I loved it. I will always cherish it. Shardul Pandey: Bollywood seems to be experiencing a renaissance of sorts, with new directors and new subjects ? Would you like to say anything on that ? Any advice for future filmmakers? Vivek Sharma: I consider this phase of Hindi cinema THE WORST phase where anybody is making film and anybody is becoming a star. Cinema is a platform for talents and artists which has disappeared completely. Its very sad. Corporate and certain banners have made it a mere business thing. I feel we as film makers must make filmz which has good content and better craft. New film makers should not get into this trap of so called “new age cinema” its the worst phase. Shardul Pandey: Sometime back I read on Filmzone Creations social media news feed that you are launching a Music Company ? Vivek Sharma: Yes, Filmzone Creations is launching its music company as I have many film projects, in many languages and trying to bring back Indian classical and melody back on the horizon, a good class music is a promise. Shardul Pandey: Movie making can be a time-consuming job so would you like to explain the time commitment you put into your movies. What do you do for entertainment? Do you have any peculiar interests? Vivek Sharma: I am not just a film maker, I am a shayar too:)I am ready with my shayri book which will be published soon. I love sports. I cycle a lot. I am a fitness freak, very regular in gym. Shardul Pandey: Where netizens can find you on Internet, your official blog is no more active ? Do you own a domain as being online actually means having a domain of your own because that is your real web-address, it saves you from straying homeless on Internet ? Vivek Sharma: I was writing on the same platform where Mr Bachchan was writing blogs. My blogs were widely read but bigadda sites crashed and now I will write on “vivek sharma’s creative gallery” which will be launched soon but people can find me on my page “Vivek sharma’s official fan page” on Facebook. Shardul Pandey: Got it about your weblog. Yes they scaled down their social networking and blogging services in July,2011. It is always better to work from the domain your own because there you get to ultimately control everything that happens in your webspace and others get excluded from doing anything without your permission. Shardul Pandey: What is your ultimate message for netizens ? Shardul Pandey: And from personal experiences what do you say to young people out there struggling to get into the film industry? Vivek Sharma: I never consider journey as “struggle”. Its a process, its all about passion for cinema. I think youngsters should spend more time with themselves rather than sitting in coffee-house or in gym. They should read more. They must use their energy in constructive work and most important is focus dedication and faith. 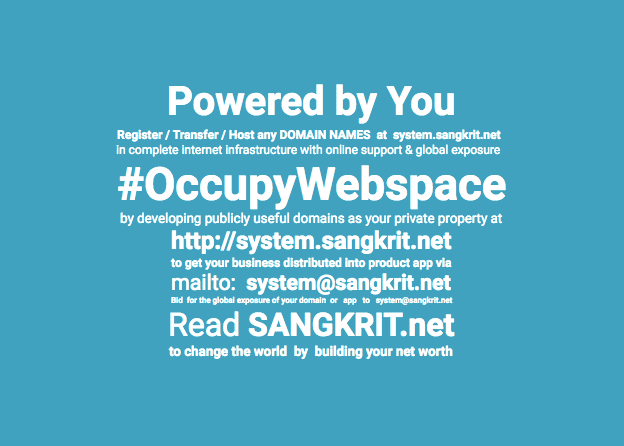 Shardul Pandey: I welcome you Luís at SANGKRIT.net, please tell our netizens about yourself. Luís Caracinha: I’m Luís Caracinha, a Portuguese communication designer living in Faro, south’s Portugal. I’m 24 years old and after 6 years working on design projects I decided to make a own project in cinema. In November 2011 I started developing the concept for a short movie based on a poem written by a Portuguese poet, Tiago Marcos, which talks about the story of a child and a old woman who have with them a common thing, a rope. The short film wants to invite you to think about your relation with your memories and the way we look and act about other’s life. The rope’s project started full-time on February 2013 when We Make Productions decided to hug the project. In few months we got a 40 members team counting with camera men, director of photography, costume designer, story-boarders, translators, production assistants, press team, hairstylist, make up, etc. Also Original Features, an important film producer in Portugal, decided to support this short.The project is now in post-production and we are counting to launch it on the first semester of 2014. We have people working with us in countries such as Spain, Italy, France, Switzerland, Germany, England, Greece and Russia. The team is made by young professionals who have a great talent and got this project as an opportunity to show how good they are and how many talented people exists in our country. Shardul Pandey: What do you hope audiences take away from your film ‘The Rope’ ? Luís Caracinha:The Rope is an invitation to build a review of our life until now. To look around, to think out of our routine and to ask ourselves how we want it to be in the future and how we treat those around us, who have a so much to share and teach. We think about our future in an specific way, almost all the time. We have a goal and a path. The thing is, the possibilities to reach your inner “self” are infinite. You must choose and think about what you are becoming every day. And that’s because you are constantly changing. Shardul Pandey: You said you are developing the concept for a short movie since 2011 so what are your experiences ? What advice can you give for first time filmmakers? Luís Caracinha: When I have an idea, I need time to let it grow. When you want to express it and put people thinking about it you should take a notebook and write all the possibilities. Talking to people about your ideas is also very important. That’s why I started working in this short-film in November 2011 but just started to materialize it in February 2013. Before this year I wasn’t prepared to make the short film. I hadn’t a team, and I hadn’t support. When I shared my idea with We Make Productions and its production team, a bright green light turned on in my mind, and here we are! During the filming, our main “enemy” is time. Time is money in a production with 40 people and you are always feeling that you could do it better. Basically you always want another take. That’s when the producer come sin and shouts “No, your late!”. Time management is crucial in order to have the team working well and with enthusiasm. Oh, and also a lot of food and water! As director, when you write a script and start imagining it on the screen you don’t have any limitations. You imagination can go wherever you want. This is one of the best parts of creating a film. You are always looking for the best and most beautiful way to show people what you want them to feel. And everything looks easy until you get a producer. In this point everything changes and you start looking to your script, and then to your storyboard and after, to your budget. Here comes the funny part of the creative process: to adapt what you imagined to the best way of showing it, using your budget. In this stage, it is only normal to feel a lot of desolation, but as director, you must know how to work with it because it’s very hard to put on the screen the exact same image you dreamed of. My advices are: Be flexible to changes. Accept other opinions because your are making films for people not for you. Think out of the box and let a personal mark in your project. Learn how to work under pressure and with a real budget. Look always for beauty, even when it must look ugly. Be clever when choosing the right team for work. Luís Caracinha: I hope this short film gets the possibility to touch the audience. I would like to invite everyone to follow our work in the social networks and on our website www.therope.pt. There you can find all information about what we’re doing. Until Februrary/March 2014 we will be working on post production, the original soundtrack composition and promoting the short film. Unfortunately, there are a lot of investment that we need in order to improve the final result of the film. We are still looking for donations. If you believe in our work and want to support this project contact us by sending an email to info@therope.pt. Thank you Shardul for your interest. Inspired for acting by Yash Chopra’s Shahrukh Khan starrer superhit Hindi film Dil To Pagal Hai, stage dancer Shriswara is at first seen upon celluloid screen in Rakeysh Omprakash Mehra’s period film, Bhaag Milkha Bhaag before to fully act Nafisa in D-Day as RAW agent Wali Khan(Irfan Khan)’s Pakistani wife. Her own early life experience at Lucknow helped her in naturally doing so since Indian sub-continent is still so similar at the core. Shardul Pandey: I welcome you Shriswara at SANGKRIT.net, please tell our netizens about yourself, your story. Shardul Pandey: Think back to your first audition. What was it like? Shriswara: My first audition was for Samsung with Aamir Khan. I was a little more excited about Aamir than the ad itself. There was a long line at Nirvana Studio 97, Shreeji. There wasn’t anything scary, actually, at that point. I had waited quite long to give an audition and internally was prepared. I gave the audition and went home keeping my fingers, toes, eyes, feet, laces, brain, everything crossed for the next week, but of course, nothing happened. That was a bit of the hard part, as that happened 250 times again before I landed my first ad eight months later. Shardul Pandey: So what advice would you give to newbie actors and someone who wanted to do what you do? What do you like most about this profession ? Shriswara: I would say to a newbie that they’d better want this with every last electron in their soul. If luck is on your side then yes, things fall in place coincidentally, else you can do everything in your power without any positive result, and despite obsessive desire, it’s usually the later most of the time. You have to keep your heart and mind open to failure but remain tenacious, else it will eat you alive from within. What I love about acting the most is acting itself. When you finally act in something you love, in my case, D-Day, all the complaints, all the frustrations, all the tried patience become worth it. You become free of everything, including yourself. Shardul Pandey: After acting in D-Day, what you learned about yourself from the experience? What are cushy and hard parts of acting? What is your profession’s greatest challenge today? Shriswara: After acting in D-Day I’ve learned that I still shouldn’t lose my patience. I’ve graduated, perhaps, to level two of the video game. Challenges have also graduated and this time in different disguises. The difficult areas in acting for me is making sure what I feel internally reaches my face and body language. My heart can be pounding in my chest in the scene, but the audience cannot see or feel that unless I emote correctly. Getting that balance is difficult. My professions greatest challenge is staying afloat outside and inside of the industry. Choosing desired work, waiting for desired work, achieving that work and still be able to eat and pay rent in Mumbai; plus balancing the pressure from those related to you. It’s hard to explain to them why it takes so long and requires so many interviews before you’re seen on screen consistently. Shardul Pandey: I must applaud you for your phenomenal instincts in acting. What you feel is your strength as an actor and how would you like to be remembered ? Shriswara: I believe my strength as an actor is that I’m emphatic and emotional. I’d like to be remembered as being a good human being. Shardul Pandey: So now what’s next for you? What can we expect from you this year or in the next few years ? What kind of character roles do you prefer and where do you see yourself in future ? Shriswara: I have no idea what’s next for me. What characters are in line for more, which will be taking birth in scripts that I may be a part of in the future, I haven’t any idea and perhaps, it’s better that way. This year of 2013, you can expect a low profile from me. Inshallah, I’ll pull a bunny or two out my hat next year. I’m not too limited on roles, except for the fact that they have to have a reason for being in the story. I have to feel what that person is feeling without the emotions being forced or cliched. As long as I’m not type casted or limited to one particular role, I’d like to play any type of any age that I can genuinely pull off. Shriswara: मानो तो सब कुछ है, ना मानो तो कुछ भी नहीं. ख्वाब और हकीकत में कोई फर्क नहीं है सिवाय सूरत के , और उनकी अपनी कोई उमर नहीं होती (Mano to sab kuchh hai, na mano to kuchh bhi nahi. Khuab aur haqeeqat mein koi farq nahi hai sivaye soorat ke, aur unki apni koi umar nahi hoti). Be practical about your dreams, but not cynical. Be dreamy about them, but not completely careless or gullible. Be flexible where required and rigid when needed. Don’t give up; what is desired will come. Shardul Pandey: Yours is an exotic name almost unique upon world-wide-web and that creates highest possible value upon largest media of humanity i.e. the Internet. Internet is distributed in to domain names. You must have one like shriswara.com as that would indeed be accommodating your fan-following independently to make some value for you. Have a domain, use WordPress, integrate all social networks from within that to regularly keep on blogging about little things of life. This works wonderfully in show business. Kenneth Mader is known for his strong visual sense of storytelling, along with musician’s sense of timing and a knack for working with actors, Kenneth Mader is a multi-award-winning writer-director-editor and skilled cameraman recently nominated into the NBC Universal Directing Fellowship. He has a successful feature in release through 20th Century Fox that premiered on the SyFy Channel and another picture he worked on recently won Best Feature in the New York International Film Festival as well as the Audience Choice Award at the Idyllwild International Festival of Cinema. He wrote and directed an award-winning 35mm short film starring Andrea Thompson (“NYPD Blue”, “24”) and the late Don S. Davis (“Stargate SG-1”, “The X-Files”), directed a romantic comedy starring Michael Sorvino that premiered at the Method Fest film festival, wrote an award-winning screenplay “Deep Focus” that took home Best Feature Screenplay in its category at the Action On Film Written Word Awards, along with Excellence in the Craft of the Written Word for his action-adventure script “Razer”. He was born and raised in Chicago where he began his film career as a young production assistant, moving to Los Angeles in 2001 after securing distribution on his first feature film “Carnivore”, which went on to become a domestic home video and international cult hit. He is a founding member and former President of the Chicago Screenwriters Network (co-founded along with “Criminal Minds” executive producer Edward Allen Bernero) and has made his living in L.A. as a writer-director-editor and cameraman ever since. He recently cut a music video for Lakeshore Records and CBS Films’ “Beastly” motion picture soundtrack and directed another music video for indie label Dark Star Records that landed on the Top-10 of the national CVC rock charts. His development & production shingle Maderfilm has numerous projects in the pipeline, currently in production on his next feature film “Displacement”. He is also a RED Digital Cinema Professional now offering full RED production and post capabilities. I welcome you Kenneth at SANGKRIT, Did you always know you were going to be a movie producer ? Yes, pretty much from the womb. I joke, but as early as I can remember I wanted to be a filmmaker. My father bought me my first Super-8 film camera when I was 8 years old and I never stopped making movies, just graduated to bigger and more expensive equipment as I got older. So from early childhood I’ve been obsessed with filmmaking and all things movie-related. In fact seeing J.J. Abrams’ SUPER 8 a couple of summers ago was a truly surreal experience for me. I grew up in the late 70’s (okay, yeah, I’m dating myself) and was enormously influenced by Steven Spielberg’s early work so I totally connected with the “Spielbergian Zeitgeist” of that film and its characters in a profound way. I basically was those kids in that movie, making films in the suburbs of Chicago with the very cameras they used in that picture, reading the very same Super8Filmmaker magazines (in fact I believe I have the exact issue featured in the movie on a shelf in my office — the same shelf I have my old super-8 cameras on display; I call it my “museum”). I even built model train sets in my parent’s basement, blew them up with M-80s and filmed the destruction. And just like the teenage director character in the film, I had an obsession with “Production Value!” that carries on to this day. You are a multi-award-winning filmmaker so starting from your first film to “Displacement” how do you see your journey has been? In many ways my journey has echoed other filmmakers and in other ways it’s been quite unique. Despite starting as a kid, I’m a bit of a “late bloomer” compared to many, having not begun shooting my first indie feature until my late 20’s (“Carnivore”) after a number of false starts and financing debacles on other projects… which then took over a decade to complete and finally get released! Yep, 12 years from start to finish, raising money as we went, funding it with credit cards, building sets in my producing partner’s basement and my parent’s garage, the works. It was nuts. Took 2-1/2 years just to get it shot and in the can – imagine the continuity nightmares – then another 9 years to find completion funds and deals to finish post-production. It was quite the trial by fire and an exercise in extreme perseverance. But we ultimately landed a sales agent and a number of international deals, with distribution through 20th Century Fox and a premiere on the SyFy Channel, so in the end it was worth it and provided me the impetus and opportunity to move to Los Angeles, start working in the industry and ‘upping my game’. I’ve since produced and directed over a dozen films, many of them award-winning, all of them leading to this, my first theatrical feature. Have you done any extensive research for your film “Displacement” ? Very extensive. I spent nearly 4 years researching and writing the script, going through numerous drafts and consulting with a good friend of mine who is a quantum physics expert. He has been incredibly helpful with the science aspects of the screenplay which has also helped tighten the story and add some interesting and intriguing elements. Time travel is a tricky genre to write in, dealing with non-linear storytelling, “Grandfather Paradox” and the like, making sure the science is both accurate yet accessible and understandable for an audience. It’s a delicate balancing act. Plus with so many great films that have come before, it’s challenging to find an original take on the subject. But I believe we have, and focusing more on the characters and their journey plus the fact that it’s my most personal screenplay to date has helped. What do you hope audiences take away from your film? My desire is that audiences come away from the film renewed, having experienced a deeply emotional journey with our characters that explores a range of issues, not the least of which is losing a parent and the grief and sometimes guilt associated with that. I’ve lost both my folks now over the last few years which was a major motivating factor for me to write this script and make the film. At its core Displacement is a story about letting go of the past. It’s about making oneself whole, using the metaphor of quantum physics and particle pairs to tell that story. I hope it can touch audiences in the same way it’s touching me and my team, and perhaps help some people heal in the process. At the very least I hope they’re entertained and enjoy the ride! You already shared the easiest parts of filming so now tell us about the hard parts of filming ? The hardest part for me is actually raising the money, and consequently working within the confines of a limited budget. Though at times it can be liberating as you don’t have money to throw at problems, rather you need to be inventive and creative, it is also frustrating and the bane of every independent filmmaker’s existence. The “money thing”. Hence why we’ve launched a crowdfunding campaign to help raise at least part of the funding we need to complete the film, with the rest coming from equity deals and investors. How important is it for you to have your films screened at festivals ? Festivals to me are very important and have become a large part of my filmmaking experience over the last few years. They are typically the first time you get to screen your film in a theatrical environment for an audience of complete strangers. It is both exhilarating and nerve-wracking. A crucible of sorts. But it provides enormous feedback and an opportunity to see if your picture is working for an audience. Festivals can of course also be a launching pad into securing distribution for your film. Plus they tend to level the playing field and set you on even footing with other artists, even A-Listers and celebrities who may also be screening their films in the event, so opportunities abound to meet and create relationships with people you otherwise would never get a chance to speak with. And then if you’re lucky enough to win some awards and gain some recognition, who knows where that might lead. What do you feel is your strength as a director and how would you like to be remembered ? I would hope to be remembered as solid visual storyteller who at the very least entertained a few people, inspired some thoughtful conversations, touched audiences emotionally, enlightened some perhaps, communicated a few interesting ideas, and at best helped affect some positive change in the world or humanity at large (sounds lofty I know, but I believe movies have that power). I take great pains to create an interesting visual canvas for the audience to experience and seem to have this innate ability to achieve very high production values regardless of budget. But even more important is an ability to work with actors and help guide them to deliver award-winning performances. I really enjoy collaborating with great actors to bring a character to life on the screen and create authentic emotional moments. Working with actors is sadly something that is not a major focus of film school, and it should be. The actor is your portal to the emotional heart of your picture. If as a director you don’t understand the actor’s process or how to talk to an actor, I believe you are missing a crucial element of the filmmaking process, perhaps the most important element. So working with actors to create emotionally authentic characters and strong visual storytelling is how I would like to be remembered. What’s next for you? What other projects you are currently working on ? My next film is a bigger budget supernatural thriller I wrote entitled DEEP FOCUS which has an Academy Award-Winning actress attached to play the lead role that we’re currently seeking financing on, as well as a psychological thriller ZALI’S CRUSH that I’m packaging with producing partner Michael Sorvino (son of famous character actor Paul Sorvino). I also just landed a directing gig on another short film, have been in post-production on a celebrity documentary that should be completed soon, and am developing two Transmedia franchises, one an action-adventure entitled RAZER and the other a supernatural series called AFTERLIFE based on my award-winning film PASSING DARKNESS. That’s an interesting question. The cliché answer might be “to win an Oscar” or “Palme d’Or” at Cannes or “Independent Spirit Award”, which of course would be amazing and is every filmmaker’s dream, but realistically I just want to continue to be able to do what I love, build my production company and filmmaking career to reach wider and wider audiences with my work, and make great films. You Can Support Kenneth Mader To Complete His Movie ‘Displacement’. What is your ultimate message for netizens ? Follow your dreams. Seize them. Never give up. Don’t let the naysayers and “threshold guardians” stop you (there will be many, and they will try).